As I planned my visit to Bahamas, I was determined to keep it as much low budget as possible. I didn't want to splurge a lot on taxis and stuff. For this, the key was to use public transportation. 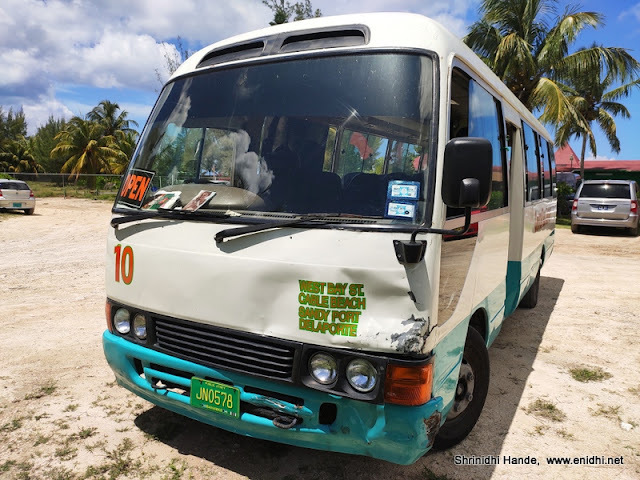 In this post I am explaining how to use Nassau Bahama's bus system. -You may have to wait a lot- up to 30 mins or more depending on location, day of the week and time of the day. - Airport doesn't have a dedicated bus terminal- you've to walk to main road to catch one. - A ride costs USD 1.25 per adult, irrespective of where you board and get down. 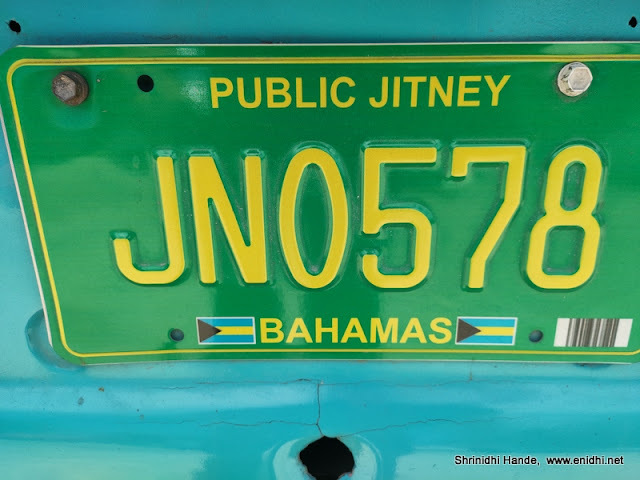 Before arrival in the Bahamas, I knew they had public transport, that the buses are called Jitney. But I couldn't figure out which bus to take from airport to my AirBnB. 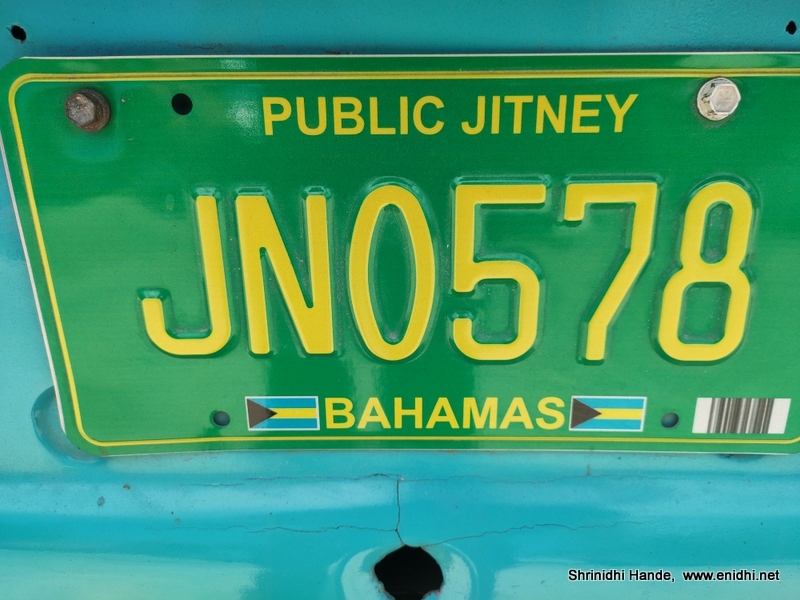 Upon arrival at NAS, I walked up to Airport information counter and asked where can I find a Jitney- they advised me to go to main road outside the airport and also advised it may be long wait. It is surprising that airport doesn't have a bus stop and buses plying nearby do not have a designated stop at the airport or near it. I walked to main road, it was hot day- wasn't sure what to do, where to wait, so kept walking towards city. I would have walked about 500 meters, I saw a bus coming towards the airport. I didn't know where is the nearest stop and if it would stop for me. Waved my hand anyway and to my surprise the bus pulled over a few hundred meters ahead. Driver patiently waited as walked and boarded. I didn't know where the bus was headed, but decided to take a ride anyway. Soon I figured it is headed towards Downtown Nassau. The bus first went to a hotel - waited for about 10 mins as some passengers from the resort were supposed to board. This was new to me-public transport bus going to private property and waiting for customers. 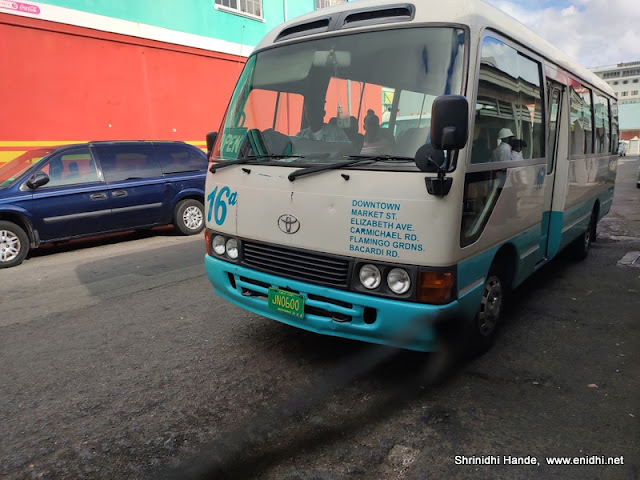 But looks like it works in Nassau- since the public transportation is limited, drivers entertain a request if a minor deviation is requested or hotel staff ask for a pickup. Good thing is we could get off the bus, take a few pics of the beach behind the resort, use resort's rest room and get back into the bus. Next the bus rode all the way on the scenic highway covering Love beach, cable beach etc. I got lots of scenic views on this journey and got good idea of what to expect at the Bahamas. I had to go to Bethels' Ave off JFK Drive. Driver advised me to get off at a point and get on to another bus, 10 A. But I didn't get any 10A even after waiting 10 mins, so I started walking. My AirBnB was some 3kms+ from here, so had to walk all the way. In the afternoon walked back to JFK Drive, waited for 10A, got to down town Nassau. Explored around a bit and it was 6.30 PM on Sunday. Waited till 7.30 PM for a bus back to JFK drive but there was none. Few people told me not to wait any longer as bus service is limited on Sunday and unlikely after 7.30 PM. I was asked to go Hilton and ask them for a cab. My AirBnB was some 5.4 kms from downtown. I decided to walk all the way. 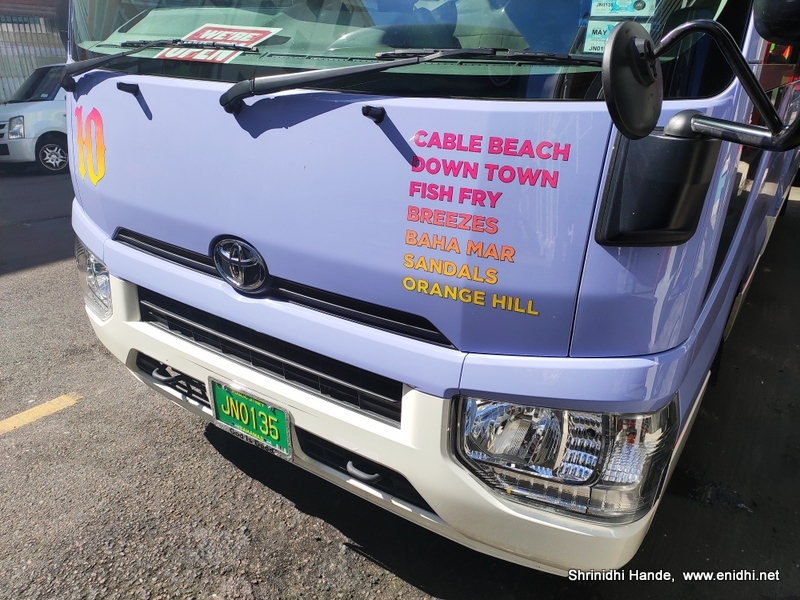 How to find taxis in Nassau Bahamas? Taxis are not easy to find, particularly if you're somewhere interior. Taxis have yellow number plate with taxi written on them. 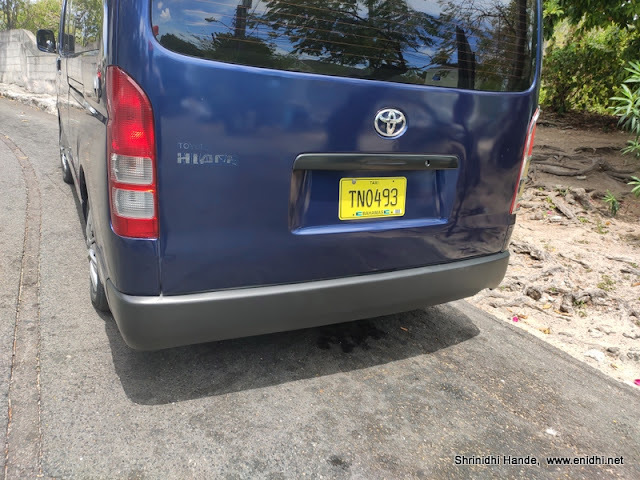 There may not be a proper "taxi signage" on top of the vehicle and any damn vehicle could be a taxi- there's no designated colour or vehicle type for easy identification. If you're in down town area finding a cab is easier, if you're elsewhere, need to depend on luck or take help from your host/hotel to get you a cab. Uber doesn't work in Nassau (at least when I checked a few times). Taxis don't have meters (at least few I checked).You need to agree on a fare- for a 5km ride a taxi driver quoted 15 USD-hearing which I decided to walk. You could possibly negotiate. Visiting Paradise Island: You can take public ferry from downtown Nassau for USD 4 one way, 8 for return. Taxi to Paradise island from down town Nassau may cost about 40 USD in fare + 2 $ toll one way + tips. 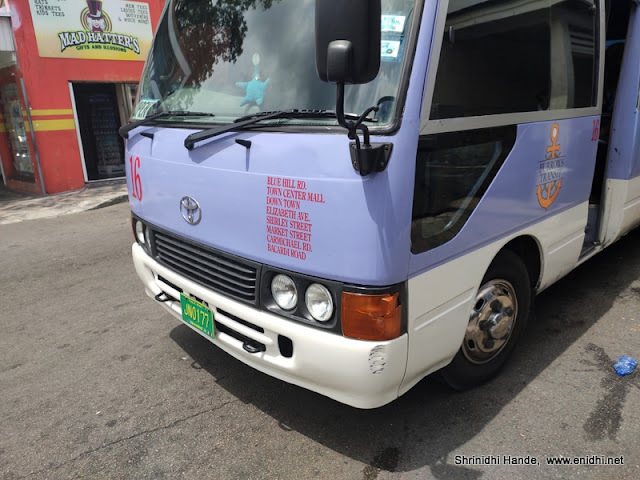 To explore Nassau using buses, stay somewhere close to downtown Nassau or somewhere on west street. 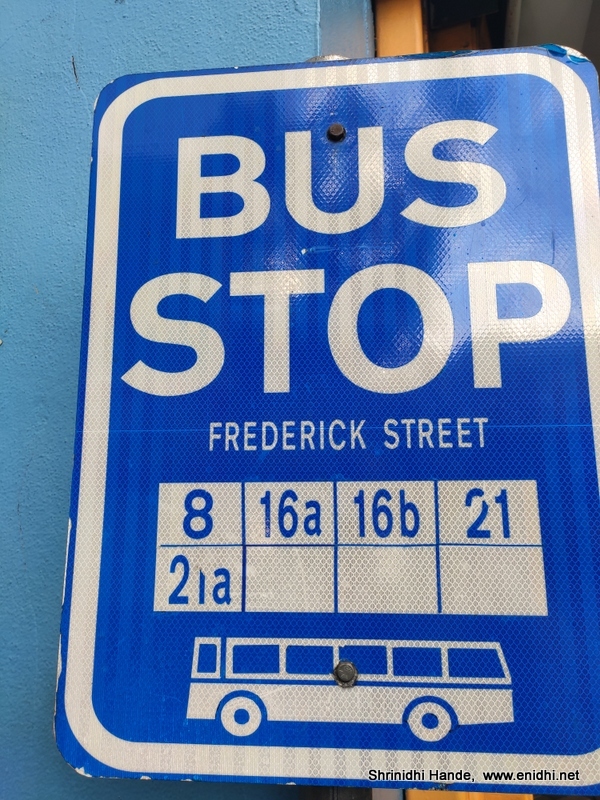 Bus numbers and destinations they serve is available here on this website. 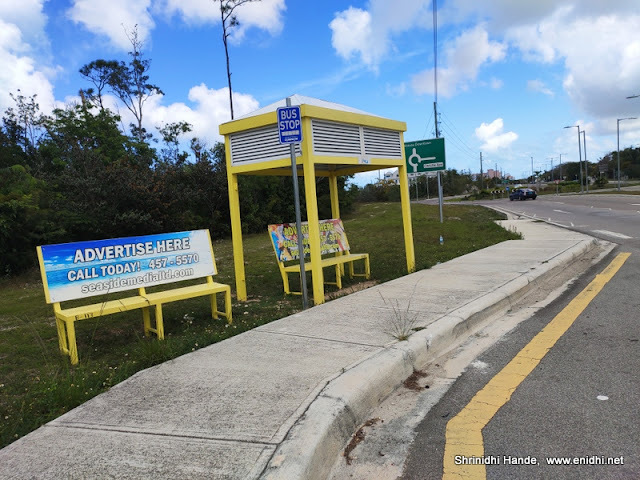 How to locate a bus stop in Nassau, Bahamas? A typical bus stop would look like this. But buses stop anywhere if you wave the drive to stop. Bahamas is a collection of 700+ islands. So it is essential to move between islands. But I couldn't identify a jetty from where we could take public ferry to various nearby islands. But I read that the mail boat also ferries passengers to various islands along with cargo. Air Bahamas operates flights to various islands big enough to have an airport. Once I took a ride in 12B till its last stop and back to down town. I was asked to pay some 3$. When I went to visit Bonefish Pond, driver offered to drive about a km extra exclusively to drop me off near the national park, at no extra cost. An entire bus serving one single passenger is a new experience for me. People pass money to drive just like we do in Chennai MTC buses. I couldn't get a bus to Jaw's Beach/Clifton Bay- net said bus no. 12 would go there, but I found its frequency too low.